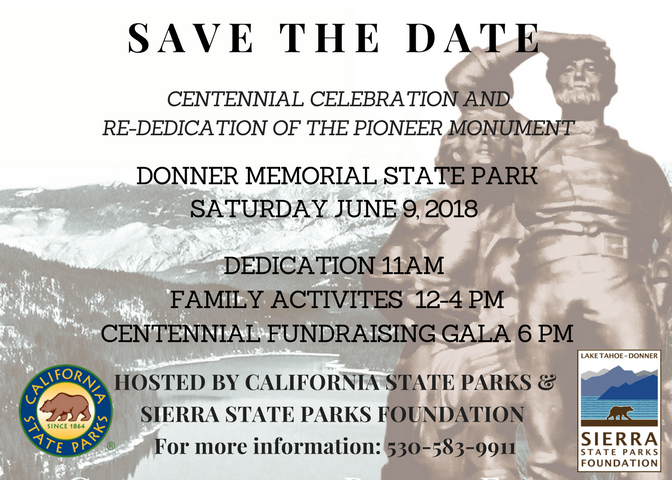 Donner Memorial SP - Pioneer Monument’s 100th birthday! Come celebrate the Pioneer Monument’s 100th birthday! Erected to honor the immigrants who passed through Truckee en-route to new opportunities in the West, the Pioneer Monument has stood majestically at Donner Memorial State Park for 99 years. At its dedication on June 6, 1918, thousands of people and three Donner Party survivors gathered to honor the past. June 9, 2018 is the re-dedication, centennial celebration, and restoration kickoff of this iconic statue.